The report's cover, painted by a participating student. The area's history is referenced with a historical map, showing the location of the original Ridge Route, and a photo from Christo's Umbrella Project. The site's Sag Pond (shown in autumm) and several maps illustrate the site's varied Geological Features. All of the proposed Preserve is privately owned. The above maps illustrate current zoning, land use (anonymous) ownerships of the relative parcels. Proposed facilities, based on the Adjacency Matrix (included on the final page) are also mapped. "Very subtle touch with dramatic results. Retains highly specific local character in the face of tremendous urbanization pressure." 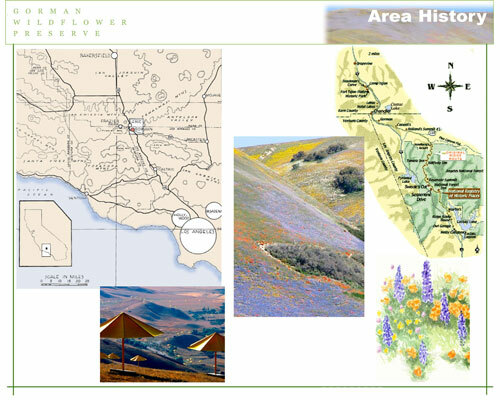 The goal of our 25-member third-year landscape architecture class was to provide a small (population 40) rural community about 67 miles north of downtown Los Angeles at the foot of the Tejon Pass with the technical documents needed to plan to preserve a 2,800-acre site that is renowned for its wildflowers. Sometimes compared to Yosemite for their amazing natural beauty, the hills of Gorman, California, come alive each spring with a spectacular display of Lupine, Coreopsis and California's State flower, the California Poppy, among many other wildflowers. The months-long show has been attracting sightseers for generations, and it was the U.S. site of Christo's 1991 environmental art piece "The Umbrellas: Joint Project for Japan and USA." But now the Gorman Hills stand at a crossroads. After serving as grazing land for generations, the area is slated for development. Plans are in the works for a water extraction facility that will generate an estimated 44 truck trips a day and construct unsightly onsite storage tanks, thereby eliminating a portion of the wildflower display and altering the local hydrology. A large residential development is being considered for a 3,000-acre parcel partly contained within the site, thereby eliminating a portion of the wildflower display and altering the wildlife corridor through the Hills. Plans are being discussed for a new community adjacent to the preserve. With 23,000 dwellings and a 14-million-square-foot business park, it would be the largest such project in the history of Los Angeles County. With proposed development surrounding the Gorman Hills, and located on a prime site along Interstate Highway 5, the Hills are threatened with destruction. 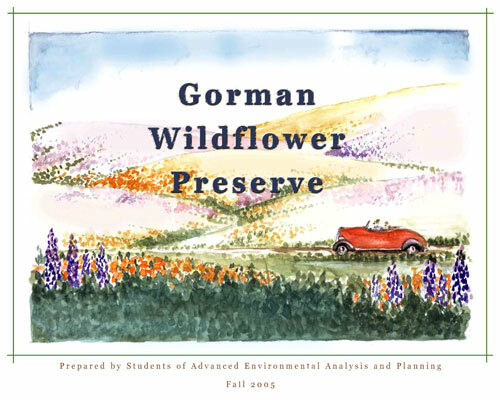 The class's response was to research and write "Gorman Wildflower Preserve," a 92-page advocacy planning document that calls for local stakeholders to band together to protect the hills that are so closely linked with the area's - an indeed the entire state's - identity, history and distinct character. 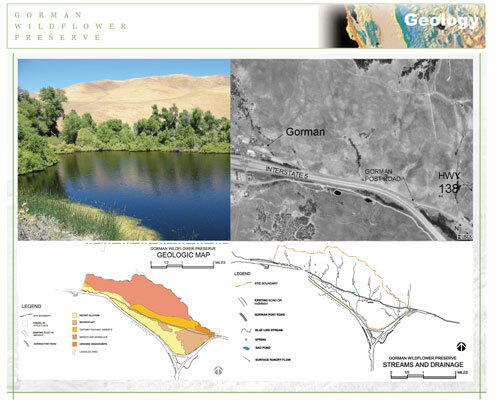 Based on research of the area's topography, geology, hydrology, history, visitor use, biological assets, etc., the report establishes proposed boundaries for a preserve along a five-mile stretch of Gorman Post Road, adjacent to Interstate Highway 5. It also presents a range of strategies for preserving the area's 48 parcels, which currently belong to 22 owners. Assembling information from a range of reports published over the years by various conservation groups, the report provides as detailed an accounting as possible of the area's flora and fauna without a complete biological report. 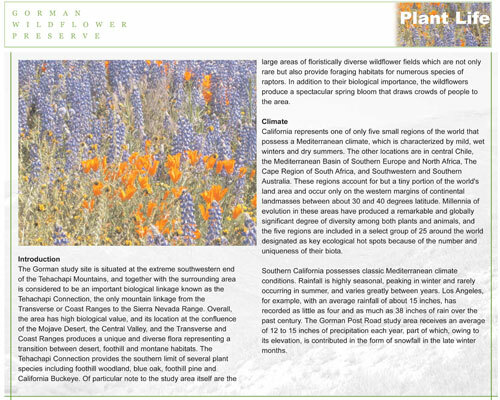 Three of the report's 19 chapters are devoted to the area's wildlife, including 80 spectacularly-flowering perennials and annuals; 16 invasive plants; 13 amphibians and reptiles; 7 butterflies; 27 mammals, including the Kit Fox, which is a Federally Endangered Species; and 132 species of birds, including the California Condor, also a Federally Endangered Species. Based on historical and geological sources, the report goes back 144 million years to detail the area's rich geological significance. 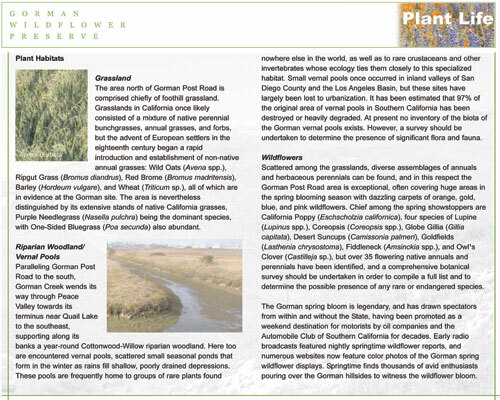 The Gorman hills stand at the rare nexus of four ecological zones and a wildlife corridor, and they include California's infamous San Andreas earthquake fault zone, which is expressed in the landscape contained within the proposed preserve. Research into USGS topographical maps revealed a less well-known distinction: the site's predominant waterway - Gorman Creek - is a blue line stream, a riparian habitat that supports species of concern and is therefore eligible for special protections. Based on touristic and historical information, the report goes back 300 years to describe the Tejon Pass area's considerable historical significance. Having served as a favored point of passage between southern and northern California since the times of the Spanish missionaries, the area is also home to the first paved crossing through the Pass, the Ridge Route. Established in 1915, the Ridge Route is located on the National Register of Historic Places. The area is also known for its role in water conveyance. At the site's southeastern end, the world's largest water conveyance system - the California Aqueduct - conveys millions of acre-feet of water from the state's water-rich north to its thirsty south. Based on research into Southern California demographics and the demographics of future park users nationwide, the report includes strategies for accommodating people of diverse ethnicities, ages and physical abilities. A chapter is based on the latest science on coping with wildfires, which are inevitable - and actually botanically beneficial - in California wildlands. The chapter spells out detailed guidelines for conducting controlled burns, the preferred method for preventing catastrophic wildfires and for stimulating new growth of native plants. 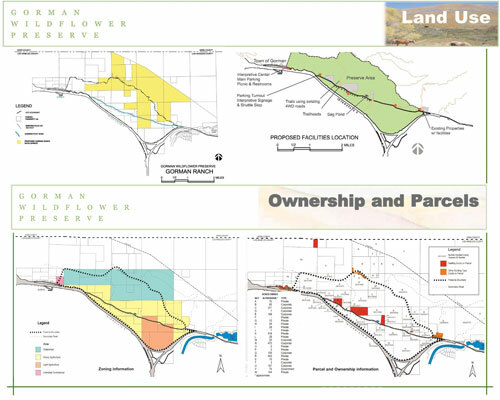 A detailed analysis of the Los Angeles County general plan and documents filed with the Los Angeles County Regional Planning Commission showed that the area has been designated a Significant Ecological Area, a distinction that affords some protections but would not prevent mining or other extractive activities. Gorman Post Road has been proposed to be designated a scenic highway. Based on research into past precedents, the document provides information on strategies and potential partners to implement the preservation of the Hills. Finally, key opinion-makers in the community were identified and their opinions about the future of the area and the Hills were solicited. The class conducted an Environmental Analysis under the California Environmental Quality Act on the proposed Preserve. The class included the Environmental Analysis in the report. This analysis touched on all aspects of the physical environment, and using the State environmental checklist, ensured that no aspect of the environment was left unconsidered. The class evaluated existing and proposed uses with an adjacency matrix, also included in the report. The class analyzed the impact of visitor facilities, such as trails and parking lots, on the proposed Preserve. The process of arriving at the final recommendations was extremely controversial. The class initially was inclined to design a wide array of amenities to accommodate future visitors, including an onsite visitor's center, a parking lot, a network of trails and public restrooms. Upon further evaluation, however, the class realized that even ecologically sound versions of visitor facilities would considerably degrade the site. The class ultimately shed each and every one of the proposed site improvements. The class recommended locating all proposed services in already developed parts of Gorman, including the visitor's center, picnic facilities, parking facilities and restrooms. The class proposed that visitors either be bused into the site via a dedicated shuttle service or walk there from town. Only dirt roads now used for all-terrain vehicles would be available for pedestrian access. An added advantage of locating the visitor's center in Gorman is that could become a central information and orientation point for the existing dozen recreational areas and parks in the vicinity, and it could also contribute to the local economy. The class reached out to some 80 local stakeholders by phone, mail and e-mail. In addition to soliciting opinions on the best course for the area's future, the class invited interested parties to free, well-publicized public presentations of the class's findings and recommendations, two of them in Gorman area. The talk consisted of a PowerPoint presentation summarizing the problem, the analysis, and a proposed plan. One of the presentations was delivered to the Mountain Communities Town Council, an advisory board that is as close as the unincorporated Gorman area has to a city council. 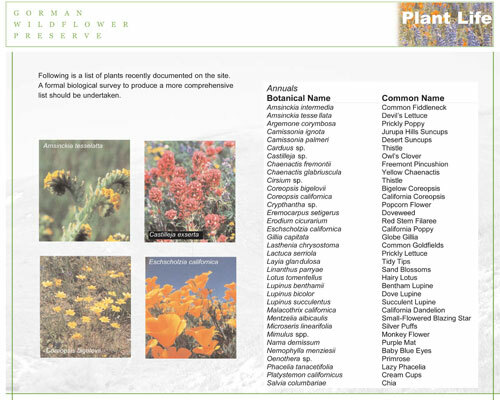 The most recent presentation was delivered to the local chapter of California Native Plant Society, a non-profit group dedicated to increasing understanding of California's native flora and preserving this rich resource for future generations. The presentations were an integral part of the advocacy planning process, generating interest and enthusiasm in preserving the Gorman Hills. So far 10 different media outlets have carried coverage of the class's recommendations, including the Associated Press, a half-page spread in the Los Angeles Times, the Los Angeles Daily News, both of the Gorman area's two newspapers and university and alumni publications. The Bakersfield Sun wrote an editorial endorsing the proposed preserve. In addition, the project is the subject of a forthcoming student documentary. To date, the class has distributed more than 50 copies of the report on CDs. Currently, the class continues to provide additional information and guidance to a local task force that was formed in the community as a result of the report. It is also lending support to an effort to create a permanent website for the findings, which so far are available online only on the Town Council's website (http://www.mountaincommunities.org/). 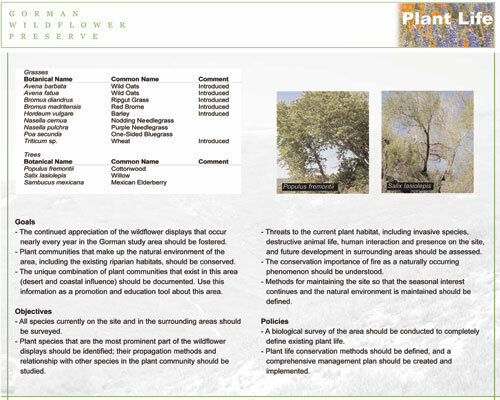 Community members have formed a committee to investigate different options for forming the Gorman Wildflower Preserve. Also as a result of the class's efforts, a land trust is evaluating the possibility of lending support to the proposed preserve. Landscape architects are trained to make interventions - to "do design." Various designs for visitor facilities were considered for the proposed Preserve. Ultimately, all were rejected, since all would have had a significant negative impact on the natural values of the proposed Preserve. Sometimes the best design is to Do Nothing - a revealing, and humbling, experience. The report calls for the creation of a local task force to seek out a lead land trust to develop a strategy for working with area landowners. The class suggested that the strategy address whether the area will be purchased in fee or purchased or donated through conservation easement. Based on research into past precedents, the document provides information on strategies and potential partners. The plan calls for the preserve to ultimately be placed in a permanent conservation easement. The committee formed as a result of the class's recommendations is now evaluating individual parcels according to their ecological value and fragility, so that the most precious and threatened sites will ultimately enjoy the greatest protections. To have a base for such a project a Plan is necessary - and thus, the class's project. The class recommended 18 different potential partner agencies. The class recommended that the broker agency for the preserve form partnerships with other agencies to manage the area. With the great interest in the community generated by the report, local stakeholders will continue to monitor the proposed Gorman Wildflower Preserve, as they have done for decades. A majority of the booklet's chapter on Plant Life is presented here to illustrate the style and scope of the students' presentation, which was compiled over 10 weeks. 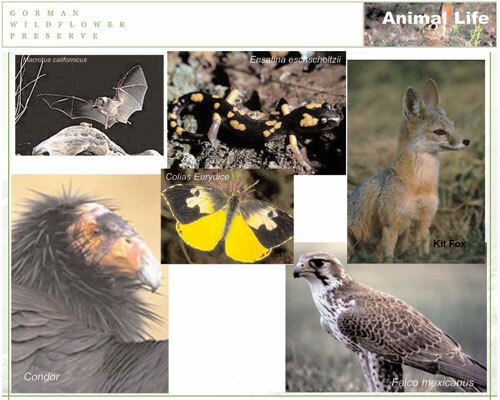 A small sampling of the varied wildlife found in the area of the proposed preserve. The goals, objectives and policies are excerpted from the chapter on animal life.